Click HERE for everything you need to apply. 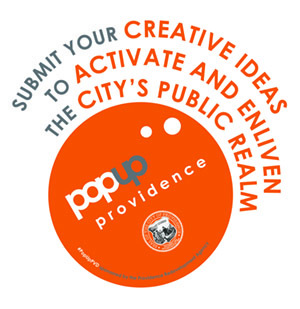 PopUp Providence is an award-winning, urban place-making program that introduces interactive, artistic and cultural displays and interventions throughout the City’s 25 neighborhoods. The program supports quick, temporary and inexpensive interventions that engage residents, workers and visitors of all ages, and enliven the city. 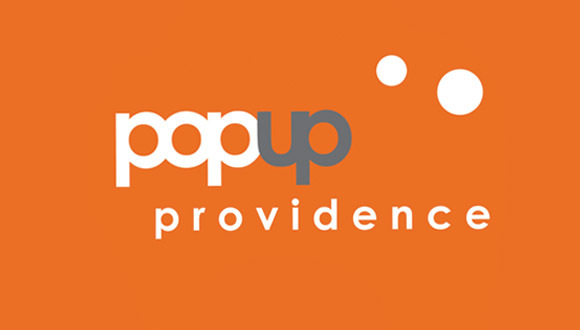 How is PopUp Providence funded? The Providence Redevelopment Agency dedicated $150,000 for the program in October 2013, in the amount of $50,000/year, for a period three years (2013-2015). What qualifies as a PopUp? PopUp PLAYSPACE: Indoor or outdoor, recreation or activity-based, projects that promote physical interaction. PopUp PARKLET: On-street parking spaces that are repurposed for public space. PopUp ART: A display of any artistic medium that is appropriate for a public setting, and directly responds to the community in which it is located. PopUp SHOP: Vacant storefronts that are repurposed for community, retail or commercial purposes. PopUp AMENITY: Enhancements to the public realm, for exclusive use by the public (e.g. seating, landscaping, bicycle parking, lighting). Any member of the public, including individuals, arts groups, neighborhood associations, institutions, community groups and non-profits. Applicants must be 18 years of age or older at the time the application is submitted. What are the general requirements of the program? Installations must be created for use and enjoyment by all members of the public, and must remain publicly-accessible at all times. Installations must relate to the neighborhood, serve and reflect the community, and activate and enhance the site. Applicants must construct and install the project within 3 months of receiving grant award. Applicants must maintain the project in a state of good repair. Applicants must operate the project, if operation is required. Applicant is responsible for at least 20% of total project costs. The PRA will provide up to 80% of project costs, not to exceed $10,000 per project. Applicants must obtain Comprehensive General Liability insurance of $1,000,000. NOW! Applications will be accepted until March 11, 2015 at 4:00 pm. Follow us on Twitter @ProvPlanning, for the latest updates and announcements. Pop-up Amenity– Lunch time kittens. I’m afraid their fur would get stuck in my teeth. They should have a Pop Up Marina weekend (with accompanying festival) in the Providence River area north of the hurricane barrier. Let people buy grid spaces to bring their watercraft in and listen to land-based music. Food trucks, live music, beer garden, boats/kayaks, sounds like a good time to me.